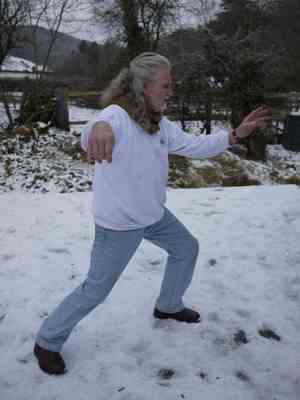 The Snake in Tai Chi. 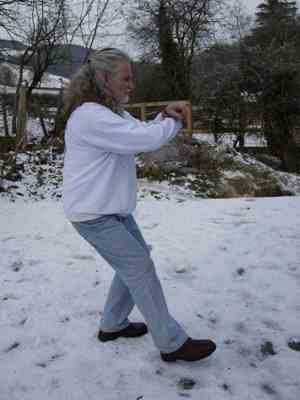 The "Snake" has always been reference to the backbone in Taijiquan. So whenever there is a tai chi posture that has anything to do with a snake as in (snake creeps down), it has reference to the backbone and the life force in the body. The spine is a powerhouse of accessible energy or Jing that we can make use of in an emergency in either self defence or in the healing area. Each vertebra is a small capacitor (as we say in electrical terms) that stores energy and releases it when necessary. During Qigong and Taiji, we are placing the body into such a natural position that each vertebra is placed perfectly on top of each other and the stored Qi in each vertebra is attached to its neighbouring vertebra. So we now have a much larger well of energy that we can then use for work. It's like having a chain on the ground, pick it up and only that portion of the chain will rise in your hand. However, if that chain is locked into some kind of cylinder, you can pick up the whole chain and if you stand it on its end, each link in the chain will fall onto the one underneath it. 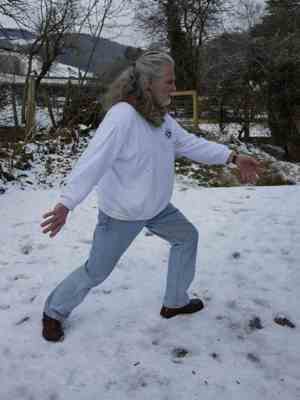 This is what Qigong standing is for and as Taijiquan is the most potent form of Qigong (when done at its most advanced levels), this also happens during our daily form practice. And this is the reason why so many are now contacting me exclaiming about the amazing things that are happening to them and their training after training in the 12 Qi Development tools, which come directly from the Old Yang Style of Yang Lu-ch'an. They are then able to take what they learn from these tools and integrate that back into their daily Taijiquan practice. 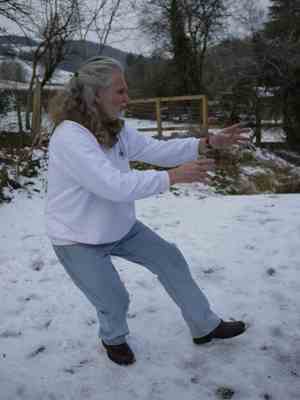 People always ask me about what I consider to be the most important tai chi postures or moves in Taijiquan. 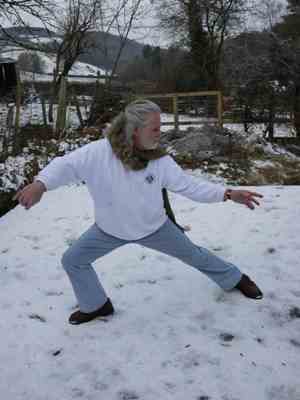 There are two movements or tai chi postures that I consider the most important. The first one is important because it is the highest level of Qi balancing internally. The second is the most potent physical healing posture of all as it wakes up one's life force, blows air onto that spark of a fire to cause it to rage. So one is a Qi or internal balancing posture while the other, although it also has Qi development parts, is mainly a physical getting well posture for the whole body. Lift Hands is possible the singularly most important posture as far as Qi Development and Balance is concerned. All of the 12 Qi Development tools begin with this posture. The posture of Play Guitar is the same as Lift Hands so we make no distinction. This posture represents the lifting of the Qi from the KD1 point up into the backbone and into the Dim-Mak/Acu points called GB20. This is what is referred to in the Classic Sayings from the old master of The Qi Must Raise Up The Back. As the hands lower again, the Qi is then balanced throughout the body as it sits back down into the Caldron or Tantien. 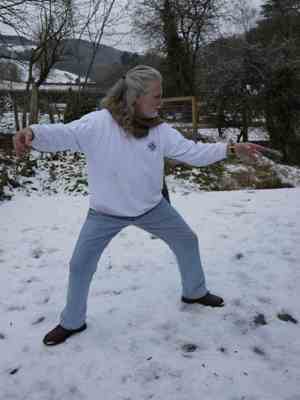 In this tai chi posture, the whole body is in a state of perfect balance with the Earth, the breathing is natural and deep which enhances this re-balancing effect of the posture. Most people just dismiss this most important posture as it isn't as fancy as for instance Stork Spreads Wings and most will just pass it quickly. However, when one performs this posture, it should be done very slowly and we must also break one of the Beginner's Rules in that we at an advanced stage, must lower the body as low as it can go without falling down. The posture is held for a count of two full breaths before continuing on to the next posture. The arms and hands during Lift Hands are like tree branches they have no feeling, nor can you feel them moving; this is SUNG. The arm movement must be performed in perfect harmony with the whole body as it rises and lowers and also in perfect harmony with the foot that will be empty. 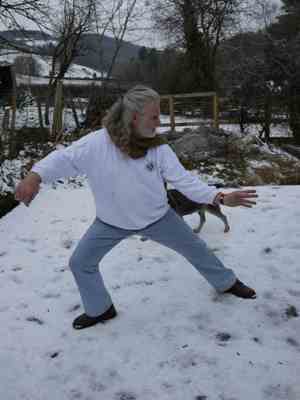 This is singularly the most important tai chi posture as far as physical healing of the body is concerned. I have given this to a group of older students and although some of them couldn't even do the posture, they all were amazed at how much energy it gave them as well as a general feeling of well being and a positive attitude. It is called Snake Creeps Down not because the left hand comes right into the groin then slides down the leg like a snake sliding down the leg! But because of the action of the left hand. The other way that most do it looks very lovely but has no meaning what-so-ever. As you begin the lowering of the body down onto the right (or left as in the Old Style) leg, the left palm will firstly go YIN, then YANG, then YIN and finally YANG again, making like a snake moving downward with its body curving in yin/yang movements. At a self defence level, this posture is a potent strike to two dim-mak points on the inside of the attacker's kicking leg SP 10 & SP 8. At an energy or Jing level, the action of the arm, hand and lowering of the body activate all of the most important Life Force meridians of Kidney, Spleen, Liver. The Snake Hand will then activate the Qi in these meridians to move right up into the spine for processing throughout the whole body. When performing this tai chi posture as a Qigong, one must go into it and hold the posture for a count of 7 seconds or 3 inhalations and exhalations at a slow pace. Then without raising up again but rather rising a little, you will change the weight as the other hand performs the snake movement and sit in the tai chi posture on the other side also for that amount of time. It is preferable to do each side 3 times. so 6 in all. And do it mornings and evenings. 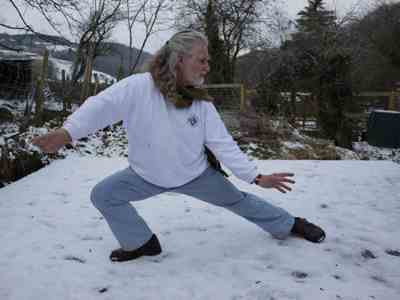 I normally do it whenever I am able, like for instance when I go for our 4 mile walk up on the mountain, before turning to come back, I will do the posture as a Qigong. Now, if you really want to get the most out of this posture as a Qigong, when you have done the last one, you should come up into the Step Forward to 7 Stars posture making the correct hand movement as you rise up, then stand in the 7 Stars posture for a count of 7 breaths which opens the 7 Star Points in the body to allow heavenly qi to enter. Even during the Tai Chi form practice, I will often simply hold the Snake Creeps Down posture for a few seconds before coming up into the next tai chi posture. At a purely physical level, you will notice that your overall flexibility will improve as well as your leg strength. Your kicks will become more powerful and as along as you keep your torso vertical, so too will your whole upper body. This posture also has an effect upon your metabolism, slightly speeding it up so that you will lose weight if necessary. You will also impress people at parties! Above Photo (7) shows R foot totally off the ground. If you touch the foot, it would be the ball of the foot that touches. The photos show: 1. Single Whip. 2. Beginning Snake Creeps Down, L hand is Yin. 3. Moving down, L hand becomes Yang. 4. Continuing, L hand becomes Yin. 5. L hand becomes Yang as you come into posture. 6. Coming up and out of the posture into Step Fwd to Seven Stars. Notice the L hand position. 7. Step Fwd to 7 Stars Posture. Notice the Yin/Yang of the two hands. 8. Lift Hands.